In this second of three articles about the most important financial decisions that affect retirement stewardship, I discuss the car purchase decision and also some general lifestyle areas. The first article in the series dealt with the all-important house purchase decision. As with housing, when you spend more than you can afford for major items, you are going to have some problems. And when your spending requires the use of debt, it can create even more problems because the more debt you take on, the more monthly outflow you will have. More outflow results in less discretionary income for other things and less flexibility and resiliency in your overall financial situation. According to the U.S. Government, transportation is the second largest expense for most households after housing, averaging approximately 25% of take-home pay. Of course, that includes gas and maintenance, which can actually cost more for older vehicles. Like buying too much house, buying more car than you can afford can cause significant issues for retirement stewardship as you end up driving the car at the expense of savings, retirement funding and debt management. According to Bankrate.com, experts typically recommend not spending more than 20 percent of after-tax household income on all vehicles in the household, which assumes an average car payment of $433 per month. I think that percentage is too high, especially if you want to give at least 10% and save at least 15% for retirement. There are two aspects of the car purchase decision. The first is whether to buy a new or used car. The second is whether to pay cash or use an auto loan. When you buy a new vehicle, you buy a nice, new car that is unlikely to have any major problems, at least during the first few years. Even if it does, the warranty should cover it. It will also look great and smell nice! When you buy used, the car will not look or smell as nice, and there is a good possibility that it will have problems during your first few years of ownership. So why would anyone buy a used car, especially if they can buy new at low or no interest? Depreciation will almost always be less in later years because the vehicle’s value will have already dropped significantly. When you buy a used car, the original owner has already absorbed the cost of depreciation. You, on the other hand, can get a great two, three, or four-year-old car at a cost below the expensive wholesale prices of new cars. Another good reason for buying used is simply that the initial cash outlay will be smaller. At various stages of life that can be appealing. Especially if you’re younger and just starting out, you can avoid taking out a loan, which will save the financing charges. When you’re older, perhaps living on a relatively fixed retirement income, it may let you sidestep selling investments to pay for the car. Also, if you aren’t sure how long you’ll need a certain vehicle before your lifestyle or needs could change, buying used is simply a smaller commitment to make and that gives you greater flexiblity. Lastly, if you’re the type who frets about scratched paint and door dings, then going for a previously owned vehicle may get you over that new-car infatuation stage sooner. Though truthfully, most recent-model used vehicles are sold in near mint condition anyway. In order to afford a new car, you may decide not to pay cash and instead take out a four, five, or even seven-year auto loan. The longer the term, the more likely you can handle the payments, but this also means that you will probably owe more than the car is worth within 12 to 24 months after you purchase it due to depreciation. Recent statistics show that one-third of car buyers sign up for a six-year loan at an average interest rate of 9.6%. Among these buyers, the average price of the car is just over $26,000. This means that one-third of the newer cars you see on the road are dealing with a $475 payment. That brand-new Mercedes sitting in front of you at the stoplight is most likely to be financed or leased. And remember, if you take out one of those so-called “five-years-with-no-interest” loans, you will still owe more than the car is worth before you know it. And what about those zero percent loans? A lot of people are lured into buying a new car because they think they are saving tons of money on interest. The problem is that’s just not true. Someone with good credit can get a used car loan in the low single digits – typically 3 or 4 percent – meaning they will only pay $300 in interest a year on a $10,000 car loan. Automakers offer zero percent loans because they still earn the same amount they would earn on any car deal, but the money is just earned over a longer span. Their cost of capital is very low so they still make money. The money isn’t made on financing but rather the car itself, not to mention add-ons, upgrades, and extended warranties. Here’s another problem: Zero percent financing can often be difficult to qualify for, and that’s where many people get disappointed. 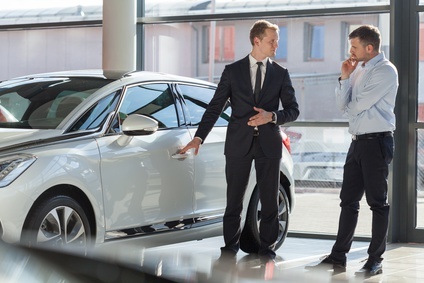 Automakers or dealers will often advertise zero percent interest, for example, even when it’s only available to shoppers with the absolute highest credit scores and a long credit history. When shoppers with only average credit reach the dealership, they find out that they don’t qualify, and then they’re presented with a higher interest rate that will earn more money for a dealer or an automaker. Let’s say that you are considering financing a new car with payments of $400 a month, just a little below the average car payment. Your current car is worth around $1,500, perhaps a little less in a year (depending on mileage). If you take that $400 and pay yourself, instead of the dealer, and add in $1,200 from the sale of your current car, you can have a $6,000 paid-for-with-cash car in just one year. You still have to pay out the $400 per month, but only for one year, not six! However, if you can do that with ease, and you repeat this process again, you’ll have a $14,000 car just 2 more years after you started saving, assuming the value of your $6,000 car has gone down to $4,500. The bottom line impact on retirement stewardship is obvious: Money not going to pay for a new car and car payments can be saved and invested for retirement, or used for other purposes. What I recommend is fairly straightforward: 1) Pay cash for your cars if at all possible, 2) buy used instead of new cars (unless your net worth is $1 Mil. or more), and 3) plan to drive your cars at least eight to ten years, especially once you are able to get a more reliable late model vehicle. If you simply can’t pay cash immediately but will drive your current car ten years or longer, you will be able to pay cash for your next car. How? If your current car payment is $300 per month and your car is paid off in five years, keep setting aside the $300 per month in a savings account for the next five years. You will have accumulated $18,000 plus interest, and this should allow you to pay cash for the next car. The key to reversing the debt cycle is driving the older car longer. I do not know anyone, myself included, who does not think it would be nice to have a new car. I have bought a couple in my lifetime. But driving the older car longer really does work to enhance financial flexibility and your options in the future. If you can pay cash for your car, it really doesn’t matter what you drive as long as you are not neglecting other things, like giving and saving. If you can afford a BMW or Lexus, it is okay if you decide, as a couple, that you want to spend your money that way as long as those other things are in order. Just be careful that you don’t have to sell it in a year or two when it becomes impractical for some reason. Another mistake people make is to develop expensive habits, hobbies, and recreational and entertainment pastimes. Although these can seem affordable early in a marriage when there are two incomes, they can become tremendous drains on the budget later on. Furnishing and decorating a home is also a lifestyle issue. Are you willing to wait to furnish the house until you have the cash, or will you go into debt to get it fixed up as fast as you can? Again, nothing wrong with having nice things in your house – just don’t take on debt for them. Another major lifestyle decision is when you decide to have children, and how many. Children are a blessing from the Lord, but they don’t come cheap. The cost of raising a child in today’s world can easily exceed $100,000 – and that may not even cover college funding. They are worth every penny, but if you decide to have a large family, you need to plan to pay twice as much in living expenses as families with only one or two children. You may have to delay saving for retirement until the children are older, in which case you may need to save extra. Just make sure you plan for that. One final lifestyle choice is the issue of education. Many people are concerned about their children’s education—and rightfully so. This concern, however, many times leads to the pressure to send the children to private elementary and high schools as well as to the finest private or out of state colleges. I have even talked with people who were planning to finance their children’s education with some of their retirement savings! The reality is that most employers don’t really care that much about GPA or your child’s alma mater. In fact, a recent Gallup survey reported that only 9% of employers place importance on the name of the school, while 84% cited the graduate’s communication and teamwork skills, and field knowledge, as “very important” in making hiring decisions. Long-term success has much more to do acquired skills, relevant experience, and hard work that it does what a graduate’s diploma says. Also, keep in mind that out-of-state schools can cost as much as $10,000 to $20,000 more than in-state ones. Private universities can cost even more ($100,000 or more per year). Managing your spending and staying out of debt, especially relative to the major categories of home and auto purchases and major lifestyle expenditures, is a critical part of successful retirement stewardship. As such, it is just as important as maximizing your income, and saving/investing. Adjusting your lifestyle so that you are always living below your means, even as your income increases, is one of the best ways you ensure that you will have the money you need to save and invest, which brings us to the next article – Decision #4: Saving and Investing.